Over 100,000 people marched the streets of Montreal on Friday to pressure Quebec’s government to take action against climate change. Some students walked out of classes to attend the protest and others were on strike on March 15, joining hundreds of other cities around the world. The march was organized by La Planète s’invite à l’université (LPSU), a group started by Quebec students with chapters in almost every university, including Concordia and McGill. LPSU is asking governments to take the necessary steps to limit global warming to 1.5 degrees above pre-industrial levels. Establishing an educational program that teaches ecology and informs young citizens about climate change are among the requests made by the LPSU. LPSU is also asking academic institutions to be more transparent about their investments in fossil fuels and to keep carbon reports. 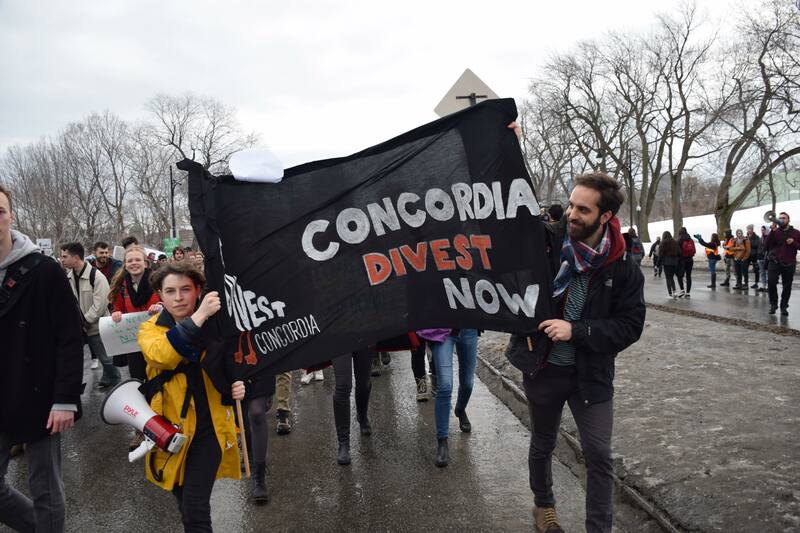 Concordia students were among those who walked out of class on Friday to join the protest. Photo by Gabe Chevalier. Québec Solidaire’s Manon Massé was at the protest as well. Photo by Gabe Chevalier. More than 100,000 people in Montreal gathered near the base of the George-Étienne Cartier monument in Mont-Royal Park on March 15. Photo by Alex Hutchins. Photos by Alex Hutchins and Gabe Chevalier.